Deadpool. Everybody loves him! And with good reason. As a character, he’s irreverent and unpredictable. He tends to shake things up in both comics and movies, asking the real questions that fans have always wondered about. Deadpool (real name Wade Winston Wilson) is a fictional antihero appearing in American comic books published by Marvel Comics. Created by artist/writerRob Liefeld and writer Fabian Nicieza, the character first appeared in The New Mutants #98 (cover-dated February 1991). 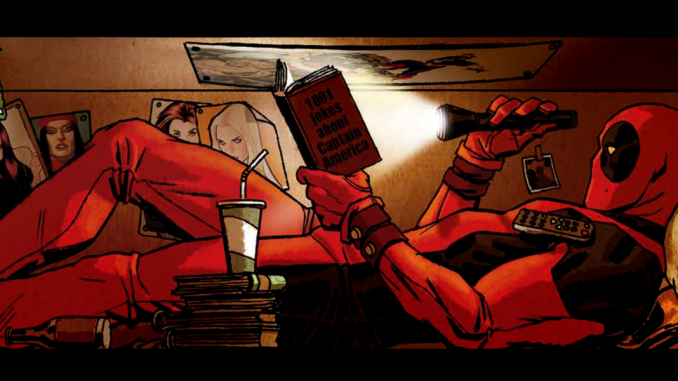 Initially Deadpool was depicted as amercenary when he made his first appearance in The New Mutants and later in issues of X-Force, but later evolved into his more recognizable antiheroic persona. Deadpool is a disfigured and mentally unstable mercenary with the superhuman ability of an accelerated healing factor and physical prowess. He is known as the “Merc with a Mouth” because of his talkative nature and tendency to break the fourth wall, which is used by writers for humorous effect and running gags. The character’s popularity has seen him feature in numerous other media. In the 2004 series Cable & Deadpool, he refers to his own scarred appearance as “Ryan Reynolds crossed with a Shar Pei“, leading to Reynolds eventually portraying the character in the 2009 film X-Men Origins: Wolverine and reprising the role in the 2016 film Deadpool. The character’s back-story has been presented as vague and subject to change, and within the narrative he is unable to remember his personal history due to a mental condition. Whether or not his name was even Wade Wilson is subject to speculation since one of his nemeses, T-Ray, claims in Deadpool #33 that he is the real Wade Wilson and that Deadpool is a vicious murderer who stole his identity. There have been other dubious stories about his history—at one point the supervillain Loki claimed to be his father. Frequently, revelations are later retconned or ignored altogether, and in one issue, Deadpool himself joked that whether he is actually Wade Wilson depends on which the writer or the reader prefers. He has professed to be Canadian. The original story had him joining the Weapon X program after being kicked out of the United States Army Special Forces and given an artificial healing factor based on Wolverine’s thanks to Dr. Emrys Killebrew, one of the head scientists.